Keep the original entry – perform the deciphering as closely to the original as possible, without correcting any mistakes made by the writer. Verses – the reading should be written in verses (greyed fragments should be omitted). 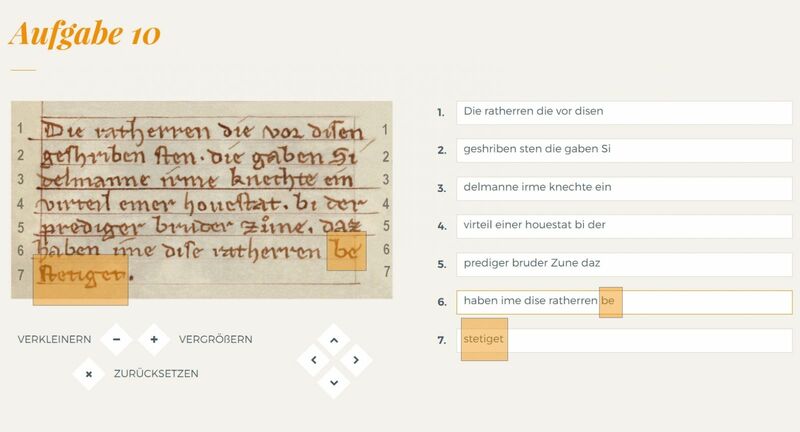 In the deciphering tool, we have prepared a separate field for deciphering each verse of the original document. Each verse and its respective field for deciphering has been numbered to help this. If a word is divided between two verses, it should be written as in the original, that is, without joining the word, an example below being the word 'bestetiget'. Punctuation – all punctuation marks (e.g, commas, full-stops, hyphens, etc.) appearing in the original should be omitted. Writing of large letters – the use of large or small letters in historical documents through the ages was not always consistent and differed from the rules currently used. This is particularly true for medieval texts, and the question whether the writer used large or small letters may be open to discussion. That's why the tool recognizes both large and small letters as being correct. Contractions – contractions used by the writer should be written in full, giving the complete word. Do not use square brackets to designate additional letters, completing the contraction. generally-accepted contractions, e.g. WMK [Wolne Miasto Kraków – Free Town of Krakow], C.K [cesarsko-królewski - imperial-royal]. The letters u and v – in Latin texts they were often interchanged, and they were also often written in an identical manner. Therefore, when deciphering a document, the form in accordance with the actual phonetic sound of the word should be used. For example, a word written in the document as ciuitas should be deciphered as civitas, and the word cvivus – as cuius. The letter Ÿ (y with dots) – should be written as ii (double short i). The set of letters qu – in Latin words where such letters appear, we write as qu (although in some cases, the writer has used qv). The letter w – this letter seldom appears in Latin texts, but we always write it as w (even when the writer has used it incorrectly). Multiple letter f at the beginning of a sentence – when deciphering, it should be written only as one f, e.g. ffrater – as frater. The letter Ÿ (y with dots) – should be written as y. Attention! In this case, the rule is different than the one for the same letter appearing in Latin texts! Letters with diacritics – if letters with diacritics, which are typical for Polish, appear in the text then we keep them in the transcription. Remember, however, that we do not correct the writers who forgot to use them! Letters with diacritics – in the reading, diacritics should be omitted, e.g. we write ü as u. Remember that this is different from texts in Polish! The letter ß (scharfes S) – we write this as ss (double s).